The New York Liberty is a professional basketball team currently based in Newark, New Jersey, playing in the Eastern Conference in the Women’s National Basketball Association (WNBA). The team was one of the eight original franchises of the league. The team is owned by Madison Square Garden, who also owns the Liberty’s NBA counterpart, the New York Knicks. 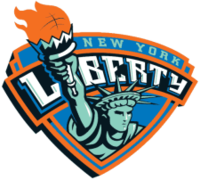 The Liberty has qualified for the WNBA Playoffs in ten of its fourteen years in New York. In 1997, 1999, 2000, and 2002, the Liberty went to the WNBA Finals but fell short the first three attempts to Houston and in 2002 to Los Angeles. They have the most appearances in the WNBA Finals without a championship. Due to renovations at Madison Square Garden in New York City, the Liberty are playing at the Prudential Center in Newark, New Jersey from 2011 through 2013.